GPIIb/IIIa inhibitors abciximab and eptifibatide have been shown to inhibit platelet aggregation in ischemic heart disease. Our aim was to test the efficacy of abiciximab (Reo Pro) or eptifibatide (Integrilin) alone or in combination with plasminogen activator (t-PA) in an experimental model of ischemia reperfusion (I/R) in hamster cheek pouch microcirculation visualized by fluorescence microscopy. Hamsters were treated with saline, or abiciximab or eptifibatide or these drugs combined with t-PA infused intravenously 10 minutes before ischemia and through reperfusion. We measured the microvessel diameter changes, the arteriolar red blood cell (RBC) velocity, the increase in permeability, the perfused capillary length (PCL), and the platelet and leukocyte adhesion on microvessels. I/R elicited large increases in the platelet and leukocyte adhesion and a decrease in microvascular perfusion. These responses were significantly attenuated by abiciximab or eptifibatide (PCL:70 and 65% at 5–10 mins of reperfusion and 85 and 87% at 30 mins of reperfusion, respectively, p < 0.001) while t-PA combined with abiciximab or eptifibatide, was more effective and microvascular perfusion recovered immediately after postischemic reperfusion. Platelets are crucial in I/R injury, as shown by the treatment with abicixmab or eptifibatide, which decreased platelet aggregation in microvessels, and also decreased leukocyte adhesion in venules. 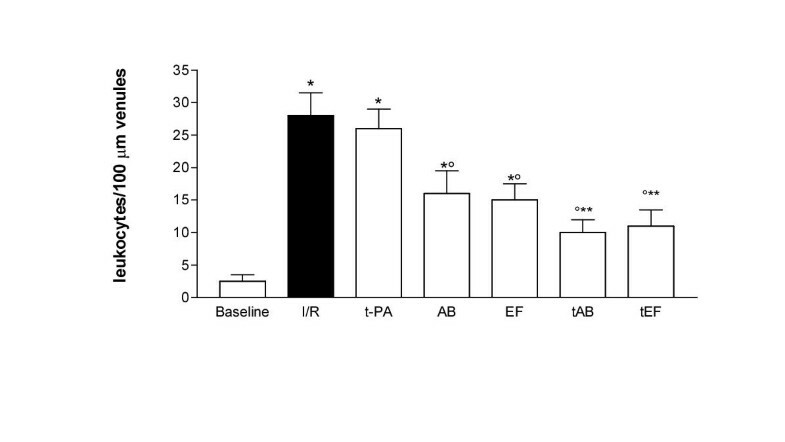 Arterial vasoconstriction, decreased arterial RBC velocity and alterations in the endothelial barrier with increased permeability delayed the complete restoration of blood flow, while t-PA combined with inhibition of platelet aggregation speeded up the capillary perfusion after reperfusion. A role for platelets in the pathogenesis of I/R is supported by reports describing a beneficial effect of platelet depletion in the no-reflow phenomenon in different experimental models of I/R [1–3]. Platelets are a major constituent of newly formed thrombi and contribute significantly to vaso-occlusive disease in I/R-induced injury because the platelet-endothelial interactions are not confined to postcapillary venules but have been also observed in arterioles during I/R . Inhibitors of the platelet glycoprotein gpIIb/IIIa have been designed, which interfere with the ability of these receptors to bind fibrinogen and thus to form platelet aggregates. These are a chimeric monoclonal antibody (c7E3 Fab), Reo Pro or abciximab [5–9] and a cyclic heptapeptide, Integrilin or eptifibatide [10–12] containing a KGD sequence developed as a high affinity mimic of the fibrinogen RGD sequence, which binds to the gp IIb-IIIa receptor. They have been shown to be specific for inhibition of platelet aggregation (and possibly adhesion) in human ischemic heart disease [10, 13, 14]. However, there have been different studies on the effects of these compounds in vitro and in humans, but the efficacy at the level of the microvessels, which comprise this network range in size from 5 to 150 μm, during I/R has not been reported. Epidemiological studies have shown complete restoration of blood flow with plasma tissue plasminogen activator (t-PA) levels but the incidence of microvascular reocclusion, caused by arterial thrombosis, is high in patients [13, 15, 16]. t-PA, released from endothelial cells, is a major activator of fibrinolysis and has a major role in platelet adhesion to damaged vessels . A combination reperfusion regimen that includes abciximab and a reduced dose of a thrombolytic agent, followed by an early adjunctive percutaneous coronary intervention, was associated with greater ST-segment resolution . Combined accelerated t-PA and eptifibatide in human acute myocardial infarction showed that the restoration of perfusion can be enhanced when eptifibatide is associated with other drugs such as alteplase, aspirin or intravenous heparin factors that can protect the endothelium . Injury to endothelial cells may suppress production of prostacyclin and promote production of tromboxaneA2 in the vessel wall thus causing platelets to become adherent to damaged vessels. Previously, we showed that the removal of leukocytes (leukopenia) was protective against I/R injury, only when it was in combination with t-PA treatment , thus showing evidence that leukocytes and t-PA play a central role in thrombosis and are involved in the fibrinolytic processes. Although abiciximab and eptifibatide exhibit significant benefits in treating I/R injury, it is unclear whether their therapeutic properties are localized in the inhibition of platelet aggregation alone or in the protection of endothelial cells with the inhibition of leukocyte adhesion molecules and endothelium-platelet or platelet-leukocyte interactions. 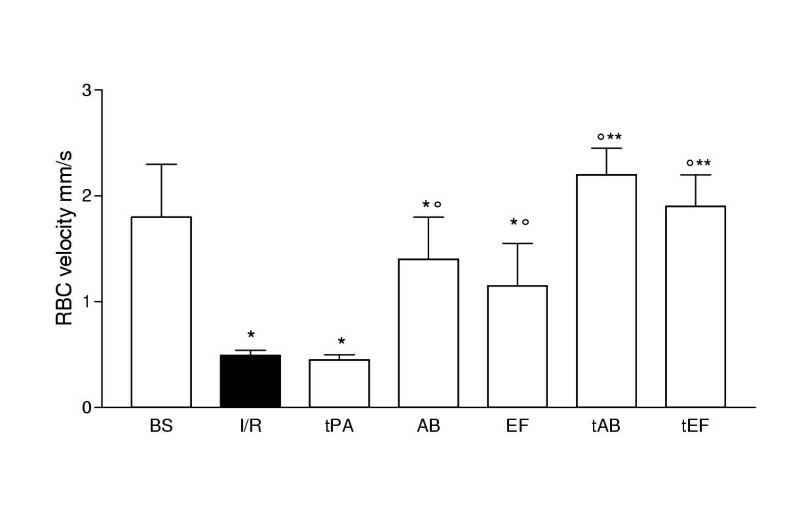 The first aim of our study was to determine the efficacy of abciximab or eptifibatide to attenuate leukocyte adhesion and to restore blood flow after I/R-induced injury in the hamster cheek pouch microcirculation. The second aim was to test whether t-PA combined with gpIIb-IIIa antagonists would increase microvascular perfusion after I/R. 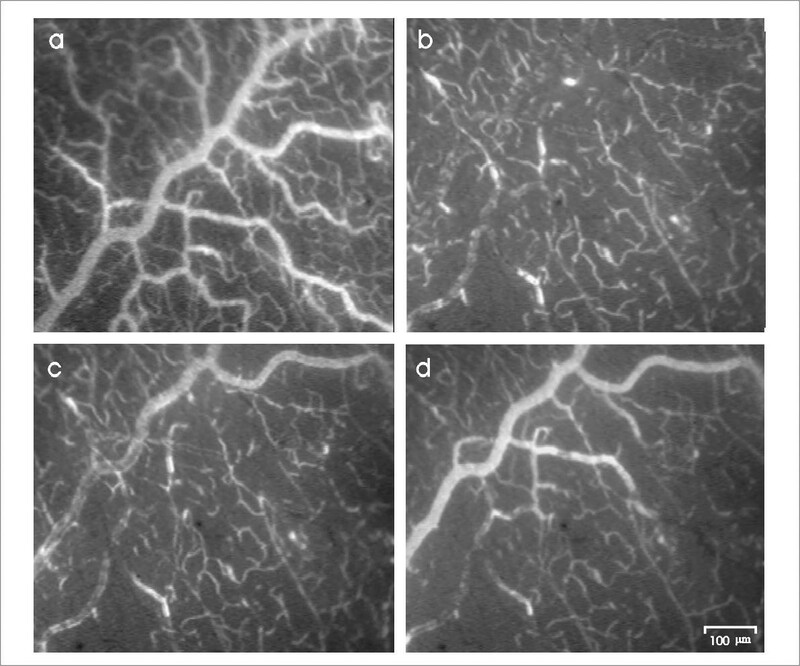 The adherent platelets and leukocytes in microvessels, capillary perfusion (capillary segments perfused by red blood cells, perfused capillary length, PCL), increased permeability, and arteriolar and venular RBC velocity were investigated by fluorescence microscopy. MAP and heart rate were 90 ± 7 mm Hg and 280 ± 10 beats/min during baseline conditions and they did not change significantly after I/R. t-PA, abicimax and eptifibatide did not affect either MAP or heart rate significantly. The changes in the diameter of arterioles (baseline: 55 ± 7 μm, n = 15) measured after 30 min of reperfusion are shown in Fig. 1. In the I/R group the diameter of arterioles decreased significantly after reperfusion compared with baseline (-45% vs. baseline, p < 0.05) whereas the venules dilated slightly. The values in tPA group were not significantly different compared with I/R group during baseline and reperfusion (tPA: -36% vs. baseline, p < 0.05). 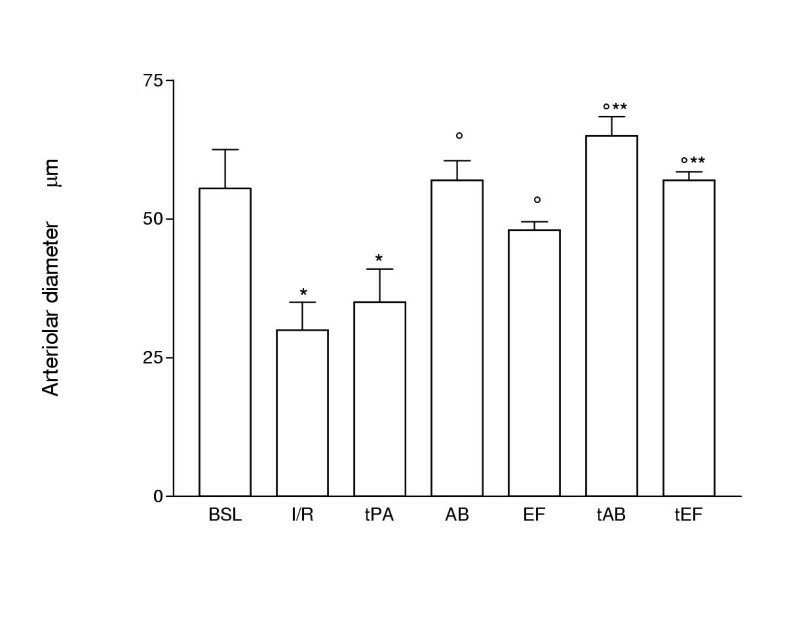 Changes of diameter of arterioles at baseline and during reperfusion in the group treated with saline (I/R) and those treated with abiciximab (AB), eptifibatide (EF), t-PA (tPA) and abiciximab plus t-PA (tAB) or eptifibatide plus t-PA (tEF), respectively. See text for details. Values are means ± SD, n = 35 experimental observations for each entry, *p < 0.05 I/R-tPA vs. baseline; ° p < 0.05 AB-EF-tAB-tEF vs. I/R and tPA; ** p < 0.05 tAB and tEF vs.AB and EF. In tAB and tEF groups there was a significant increase in arteriolar diameter compared with I/R whereas in the groups treated with t-Pa combined with gpIIa/IIIb inhibitors, diameters maintained or increased its baseline value at the end of the observation period (tAB: +12% and tEF: + 15% vs. the AB and EF groups, respectively p < 0.05). There was not a significant difference in baseline RBC velocity in I/R and tPA groups. Just after the ischemic period a significant decrease in RBC velocity was observed in both groups and during the subsequent period of reperfusion (1.98 ± 0.35 mm/s at baseline, p < 0.05) (Fig. 2). In AB and EF groups RBC velocity increased significantly in arterioles during reperfusion in comparison with I/R (p < 0.05, Figs. 1,2) whereas it further increased in either groups treated with t-PA in combination with gpIIa/IIIb inhibitors (tAB: 42% and tEF: 46% vs. the AB and EF groups, respectively, p < 0.05). Changes of arteriolar RBC velocity at baseline and during reperfusion in the group treated with saline (I/R) and those treated with abiciximab (AB), eptifibatide (EF), t-PA (tPA) and abiciximab plus t-PA (tAB) or eptifibatide plus t-PA (tEF), respectively. See text for details. Values are means ± SD, n = 20 experimental observations for each entry, *p < 0.05 I/R-tPA vs. baseline; °p < 0.05 AB, EF, tAB, and tEF vs. I/R and tPA; ** p < 0.05 tAB abd tEF vs.AB and EF. The permeability (normalized to baseline) during reperfusion in the group treated with saline (I/R) and those treated with abiciximab (AB), eptifibatide (EF), t-PA (tPA) and abiciximab plus t-PA (tAB) or eptifibatide plus t-PA (tEF), respectively. See text for details. Values are means ± SD. *p < 0.05 AB, EF, tAB and tEF vs. I/R and t-PA; ° p < 0.05 tAB and tEF vs.AB and EF. In the I/R and tPA group the number of platelets adhering to arterioles or venules and the number of leukocytes adhering to the postcapillary venules increased significantly in comparison with baseline values (Figs. 4,5). Number of adherent platelets/mm2 of vessel surface at baseline and during reperfusion in the group treated with saline (I/R) and those treated with abiciximab (AB), eptifibatide (EF), t-PA (tPA) and abiciximab plus t-PA (tAB) or eptifibatide plus t-PA (tEF), respectively. See text for details. Values are means ± SD, n = 35 experimental observations for each entry, *p < 0.05 vs. baseline; °p < 0.05 vs. I/R and tPA. Number of adherent leukocytes/100 μm venules at baseline and during reperfusion in the group treated with saline (I/R) and those treated with abiciximab (AB), eptifibatide (EF), t-PA (tPA) and abiciximab plus t-PA (tAB) or eptifibatide plus t-PA (tEF), respectively See text for details. Values are means ± SD, n = 25 experimental observations for each entry, *p < 0.001 I/R-tPA vs. baseline; °p < 0.05 AB, EF, tAB, and tEF vs. I/R; ** p < 0.05 tAB and tEF vs.AB and EF. t-PA had no protective effect on the number of adhering platelets in postischemic arterioles and venules. On the contrary t-PA combined with gpIIa/IIIb inhibitors decreased the number of platelets adhering to arterioles and venules. Concomitantly, the number of leukocytes adhering to the postcapillary venules decreased significantly compared with I/R group (Figs. 4,5). The number of leukocytes adhering to the venular wall decreased significantly by the end of reperfusion (Fig. 5) with abiciximab or eptifibatide alone (AB: -42% and EF: -46% vs. the I/R group, p < 0.05). 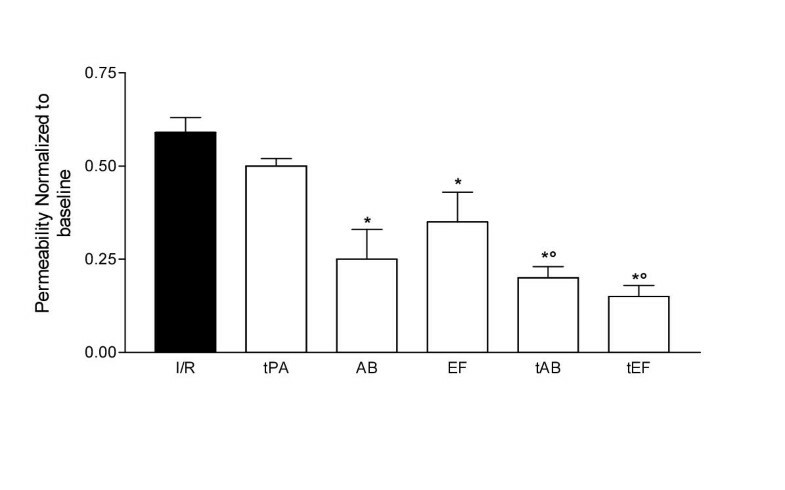 With abiciximab and eptifibatide there was a significant reduction in platelet adhesion in microvessels (AB: -72 and EF:-74% p < 0.01 vs. the I/R group). In the AB and EF groups the leukocyte adhesion to venules was -46 and -50% in comparison with the I/R group, respectively (p < 0.001) (Fig. 5). However, the number of leukocytes adhering on postcapillary venules was significantly different when compared with the tEF and tAB groups (tAB: -37% and tEF-26% vs. the AB and EF groups, respectively, p < 0.05). In I/R group PCL decreased significantly when compared with baseline (baseline: 9,130 ± 430 μm, p < 0.05, Fig. 6. In Fig. 7 and 8 we reported the photographic sequence of a hamster cheek pouch microcirculation during baseline, 30 min of ischemia, 10 min and 30 min of reperfusion. The no reflow phenomenon is evident during reperfusion as shown by the lack of capillary perfusion at 10 and 30 min from reperfusion. t-PA had no effect on capillary perfusion (PCL: 58 ± 5% of baseline, 10,080 ± 400 μm) while combination of t-PA with abiciximab and eptifibatide determined no alteration in capillary perfusion compared with the baseline (9980 ± 350 μm, Fig. 6). PCL increased significantly in comparison with the I/R group, whereas it was slightly but significantly reduced in comparison with the baseline (baseline: AB: 8,950 ± 780 μm; EF: 9,780 ± 540 μm) (Fig. 6). In the AB and EF groups postischemic perfusion in the microcirculation showed a biphasic increase because within 5–10 min after the onset of reperfusion, PCL was 70 and 65% and 85 and 87% after 30 min of reperfusion, vs. the baseline (10,500 ± 500 μm, p < 0.001). In Fig. 7 and 8 we reported the photographic sequence of hamster cheek pouch treated with abiciximab. The capillary perfusion recovered within 10 min after postischemic reperfusion and after 30 min there was not a complete capillary perfusion. Changes (%) of perfused capillary length (PCL) at baseline and during reperfusion. in the group treated with saline (I/R) and those treated with t-PA (tPA), abiciximab, (AB), eptifibatide (EF), t-PA and t-PA plus abiciximab (tEF) or eptifibatide (tEF), respectively. See text for details. Values are means ± SD; *p < 0.001 I/R, tPA, AB, and EF vs. baseline; °p < 0.05 AB, EF, tAB, and tEF vs. I/R and t-PA; ** p < 0.05 tAB and tEF vs.AB and EF. A sequence of photographs documenting I/R-induced injury in the microcirculation of a control hamster in the baseline condition (a), within 30 min of ischemia (b), 10 min (c) and 30 min (d) of reperfusion. Postischemic microvascular perfusion stopped in many microvessels and blood flow decreased significantly during reperfusion with the evidence of the no-reflow phenomenon. PCL increased significantly in the groups treated with t-PA combined with gpIIa/IIIb inhibitors in comparison with the AB and EF groups (tAB: 26 and 15% and tEF: 31 and 13% within 15 and 30 min of reperfusion vs. the AB and EF groups, respectively, p < 0.05). Interestingly, we did not observed the postischemic biphasic response in blood flow as in AB and EF groups but microvascular perfusion was restored to the preclamping level immediately after the period of ischemia. Our data demonstrated that the inhibition of platelet aggregation is a crucial event in I/R injury in microvessels as shown by the effects derived from the treatment with abicixmab or eptifibatide in the hamster cheek pouch microcirculation. These drugs reduced platelet aggregation in arterioles and venules, as well as leukocyte adhesion to endothelial cells of venules and leukocyte-platelet interactions in microvessels. Although microvascular perfusion was maintained after 30 min of reperfusion the restoration of blood flow was only within 5–10 min after postischemic reperfusion. t-PA combined with abcixmab or eptifibatide-mediated inhibition of platelet aggregation enhanced and speeded the restoration of the microvascular perfusion by protecting the endothelial barrier as shown by the decrease in venular permeability and the increase in arteriolar diameter. The results obtained in this model indicate that there was still a significant efficacy against microcirculatory disturbances after gpIIa/IIIb inhibitors alone with respect to their combination with t-PA. This suggest that the increased levels of platelet activation and fibrinolysis are involved more importantly than other factors in I/R injury. The early recovery of blood flow at the beginning of reperfusion may be protective for reducing cellular endothelial cell injuries. Previously, we have reported that platelet adhesion was not confined to postcapillary venules, but was also observed in arterioles of the hamster cheek pouch microcirculation during I/R . The decreased perfusion observed in the capillary network at the beginning of reperfusion might be related to the increased level of platelet reactivity in the arterioles during the period of ischemia. Protein kinase C (PKC) is sensitive to oxidation and could be upregulated during oxidative stress caused by ischemia. It was shown that many proaggregatory stimuli, such as oxidative stress, have activated PKC involved in the platelet activation . The increase in the oxidative stress at the onset of reperfusion could lead to an increase in P-selectin expression on the endothelial surface thus increasing platelet and leukocyte adhesion to microvessels [22, 23]. In particular, endothelial cells appear to be very sensitive to an enhanced level of platelet activation after oxygen free radicals or cytokine exposure following ischemic occlusion . Inflammatory markers, such as interleukin-6 and tumor necrosis factor-α, measured in serum samples obtained from 160 patients during angioplasty, decreased significantly in the first hours after angioplasty following administration of abciximab. It was hypothesized that some of the decreased mortality associated with the use of this agent may be related to an anti-inflammatory effect exerted by abiciximab . However, measurement of routine enzymes following early myocardial infarction did not reveal any early benefit provided by abiciximab . 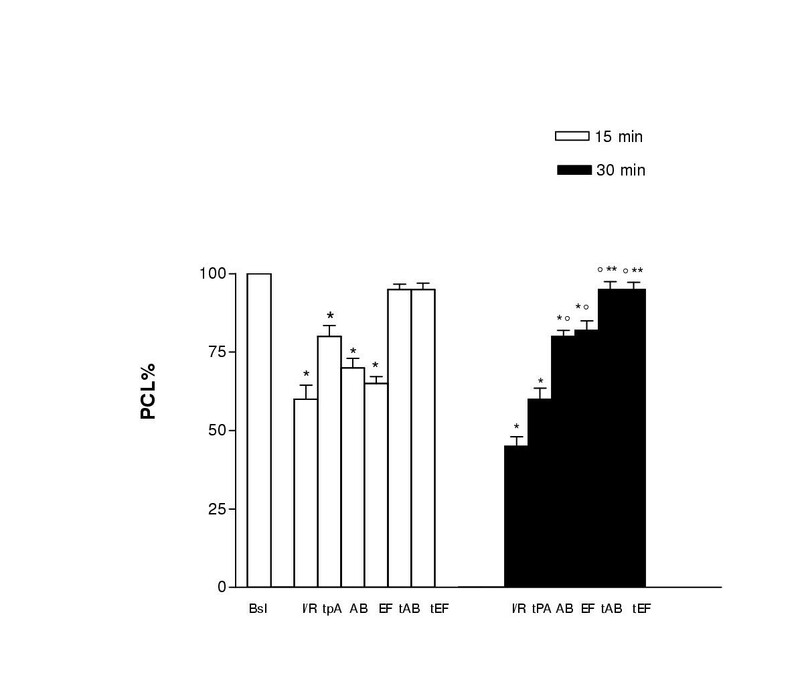 In the microcirculation of hamsters after platelet aggregation inhibition we did not observe arterial vasoconstriction or significant decreases in RBC velocity after I/R but an increase in permeability was observed during reperfusion thus indicating an impairment of the endothelial barrier. It is possible that platelets contributed in part to the delay in reperfusion through a release of vasoconstrictor substances, thus causing local perfusion deficiencies of the microcirculation with occlusion of the vascular lumen and alterations in the properties of the endothelial barrier [4, 24]. Platelets in the arterial circulation are exposed to very high shear stress at the beginning of reperfusion. The shear-induced platelet aggregation is enhanced in plasma in the presence of acute myocardial infarction, apparently as a result of increased concentration of von Willebrand factor (vWF) . Under such conditions the time for contact with damaged vessels is very limited, and it is surprising that high shear stress favors interaction of platelets with the subendothelium. Interestingly, after a first peak of adhesion, there is a rapid decrease in the number of adherent platelets, suggesting that the endothelial surface becomes less adhesive with time, possibly because vWF or other factors are progressively washed away . This phenomenon may help to explain the delay of microvascular perfusion and the reocclusion of some microvessels at the end of the period of reperfusion, as observed after treatment with abicixmab or eptifibatide. 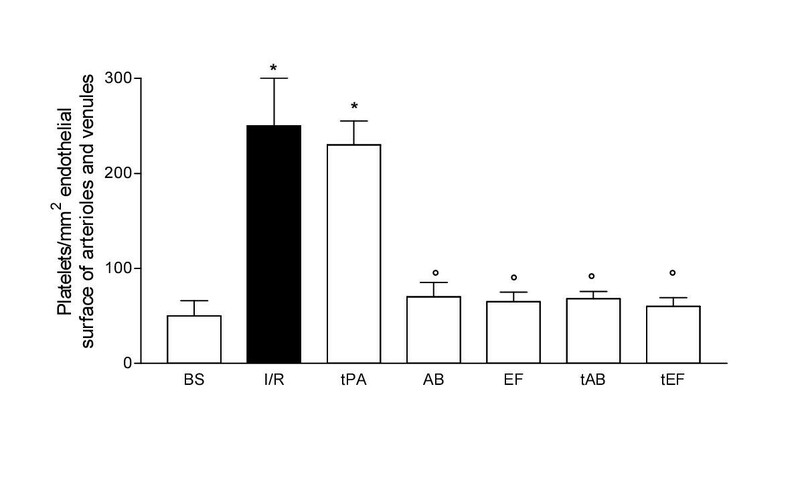 Our data show that the protective effects derived from abciximab or eptifibatide after reperfusion are primarily related to inhibition of platelet aggregation while other possibilities contributing to the improvement of I/R injury, may be related to the effect on platelet adhesion and platelet-leukocyte adhesion on the endothelial cells of the venular vessel wall. However, our data showed that the protection with gpIIa/IIIb was not complete thus showing a crucial role for t-PA. Interestingly, gpIIb/IIIa Mabs cross-reacts with the leukocyte integrin Mac-1 receptor on activated monocytes and macrophages and blocks adhesion to fibrinogen and ICAM-1 , which has also been implicated in the leukocyte recruitment associated with I/R . Our observations might highlight that platelets appear to have a central role in thrombosis in I/R injury suggesting that platelet-dependent processes in I/R injury may significantly affect the fibrinolytic processes. Interestingly, recent data show a greater tendency of fibrinolytic inhibition in sepsis in non-leukopenic patients. Furthermore, in shock conditions, levels of t-PA inhibition were high in both the non-leukopenic and leukopenic groups . In our model of I/R it appears that although abiciximab or eptifibatide restored blood flow only abcixmab or eptifibatide in combination with t-PA caused a significant increase in diameter of arterioles and recovered complete microvascular perfusion at the beginning of reperfusion thus indicating that even relatively mild forms of damage may be accompanied by local perfusion deficiencies of the microcirculation and alterations of the endothelial barrier. In agreement with our data in patients treated with eptifibatide, with simultaneous accelerated thrombolyis, it was shown that there was more reperfusion and a shorter duration of ischemia as shown by the shorter time to steady state ST-segment recovery . Campbell et al. provided evidence that abciximab is a potent and effective cardioprotective agent, thus suggesting an inhibition of leukocyte-endothelial cell interactions in order to preserve cardiac contractile function and coronary perfusion in an isolated perfused rat heart model of I/R . t-PA might play a role in maintaining microvascular patency at the beginning of reperfusion by protecting the antithrombogenic characteristics of the vascular endothelium. In ischemia the impairment of endothelial cell integrity might predominate, leading to impaired synthesis and/or the release of endothelial substances such as t-PA. Plasma t-PA is more strictly dependent on endothelial cell function and a better indicator of endothelial viability. Furthermore, the protection afforded by t-PA against the increase in microvascular permeability might be related to the reduction of O2 -- due to the protective effects of t-PA on the endothelium . Upon activation and aggregation, platelets generate oxygen radicals that could cause vasoconstriction and occlusion of the arterioles. In our model t-PA alone did not exert any protection at 30 min of reperfusion and these results are consistent with data showing that reperfusion treatment by thrombolysis reduces mortality in patients undergoing percutaneous coronary intervention, but its efficacy is limited by the occurrence of thrombotic reocclusion after reperfusion , thus suggesting that platelets serve the major role in hemostasis in arterioles during reperfusion in I/R injury. In a first systematic evaluation of eptifibatide combined with low dose t-PA in acute myocardial infarction, Brener et al. showed that this therapy is superior to standard dose t-PA alone in achieving reperfusion of the infarct-related artery 60 min after initiation of therapy . Recent data show that t-PA inhibits superoxide anion production in human neutrophils in vitro and decreases mortality in patients with acute myocardial infarction . Previously, we showed that leukocytes have a secondary influence on the fibrinolytic system after 30 min of ischemia and 30 min of reperfusion while the no reflow phenomenon during 60 min of ischemia followed by 60 min of reperfusion appears to be modulated by t-PA in leukopenic hamsters . In agreement with these data, it was shown that the percentage stenosis in the coronary arteries measured by coronary angiography was negatively correlated with t-PA activity that fluctuates because t-PA levels are different according to the ischemic conditions . Therefore, it is possible that the protective effects of t-PA might determine an inhibition of the vasoconstriction and microthrombus formation in arterioles in combination with the inhibitors of platelet aggregation, thus allowing an increase in capillary perfusion. The restoration of blood flow could be essential in the mechanism of protection, thus determining oxygen delivery to the tissue and permitting the extraction of by-products of cellular metabolism during reperfusion. The beneficial effects of t-PA might also derive from a more marked reduction of leukocyte and platelet adhesion via the inhibition of oxygen free radical formation. Although we have demonstrated a role for platelets in the response to ischemia/reperfusion, there are issues that need to be addressed by future studies. In particular, we do not know the extent of damage to the endothelial cells of the microvessels. For instance, evidence for endothelial barrier swelling or free radical injury to the tissue could be obtained by histological study of the tissue following reperfusion; however, such measurements were beyond the scope of the present study. We demonstrated that the inhibition of platelet aggregation is crucial in I/R injury as shown by the treatment with abicixmab or eptifibatide that decreased significantly, not only platelet aggregation in both arterioles and venules, but also leukocyte adhesion in venules in the hamster cheek pouch microcirculation. We have shown that the effects derived from abiciximab or eptifibatide on platelet reactivity involve leukocyte adhesion to endothelial cells of venular vessel walls. However, only the abicixmab or eptifibatide-induced inhibition of platelet aggregation in conjunction with t-PA speeded up the restoration of blood flow. Likewise t-PA decreased the levels of vasoconstriction, abolished the increase in permeability, and increased RBC velocity in the microvessels, thus indicating that even mild forms of platelet or endothelial cell activation may be accompanied by local perfusion deficiencies of the perfusion and alterations in the properties of the endothelial barrier. Male Syrian hamsters (80–100 g Charles River, Calco, Italy) were used. Hamsters were anesthetized (Nembutal, 5 mg/100 g body wt., i.p.) and tracheotomized. The right carotid artery and femoral vein were cannulated to measure blood pressure and to administer additional anesthesia and drugs, respectively. Animal handling and care followed the procedures outlined in the Guide for the Care and Use of the Laboratories of the Italian Research Council. The cheek pouch was surgically prepared as previously reported [4, 20]. The cheek pouch was gently everted and fixed to a special platform on the microscope stage. Then a thin black blade was inserted through a small incision between the upper and lower layers of the pouch. The cheek pouch was superfused with a 36 ± 0.5 °C Ringer's solution (4 ml/min), with 5% CO2 in 95% N2 adjusted to pH 7.35. Atraumatic microvascular clips were placed on the proximal part of the cheek pouch to achieve complete ischemia for 30 min. The clamp was then removed and the microcirculation was observed for 30 mins during reperfusion. Observations were made with a fluorescence microscope (Orthoplan, Leica Microsystem GmbH, Wetzlar, Germany) and a filter block (Ploempak, Leica Germany) fitted with a long working distance objective (×4, na 0.14; ×20, na 0.25) and ×10 eyepiece. Epi-illumination was provided by a xenon 150-W lamp using the appropriate filters for fluorescein isothiocyanate, bound to dextran (MW 150,000; Sigma Chemical, St. Louis, MO, USA; 50 mg/100 g b. wt., intravenously injected as 5 % W/V solution in 5 min), for acridine red and a heat filter. The area of interest was televised with a COHU 5253 SIT (COHU Inc. San Diego CA, USA) low light level camera, and observed on a Sony PVM 122 CE monitor. Video images were videotaped and microvascular measurements were made off-line by a computer-assisted imaging software system (MIP Image, CNR, Institute Clin. Physiology, Pisa, Italy). Animals in all the groups received an intravenous injection of acridine red (1 mg/100 g) to visualize the leukocytes and platelets at baseline and after reperfusion. The number of adherent leukocytes was expressed as the number/100 μm length of venule (diameters: 16 ± 8 μm, length > 250 μm). The number of adherent platelets was expressed as number/mm2 of vessel surface (diameters: 16 ± 8 μm). In each animal 5 arterioles and 5 venules were recorded on videotape. PCL, defined as the total length of capillary segments that have at least one RBC passing through them in a 30 s period, was analyzed from four to six different microscopic fields. Microvessel diameters were measured by an image shearing system (Digital Image Shearing Monitor Mod 907, IPM). Red blood cell (RBC) velocity was determined using dual slit cross correlation (velocity tracker Mod 102 B, IPM, San Diego, CA, USA). The measured centerline velocity was corrected according to vessel size to obtain the mean RBC velocity. To quantify the permeability of the venular wall, fluorescence intensity in the perivascular space was reported as normalized to baseline grey levels: NGL = (I - Ir)/Ir, where I is the average baseline grey level and Ir is the same parameter after reperfusion . Grey levels, ranging from 0 to 255, were determined by the MIP Image program. The size of the window used to measure average fluorescence intensity was set at 50 μm long and 50 μm wide. Mean arterial blood pressure (MAP) (Viggo-Spectramed P10E2 transducer, Oxnard, CA, USA) and heart rate (HR) were measured by a Gould Windograf recorder (Mod. 13-6615-10S, Gould Inc., Ohio, USA). All reported values are means ± SD. Differences were tested by paired and unpaired t-test. For analysis between groups, the Kruskal-Wallis test was used, followed by the Mann-Whitney U test. Differences were considered significant at p < 0.05. 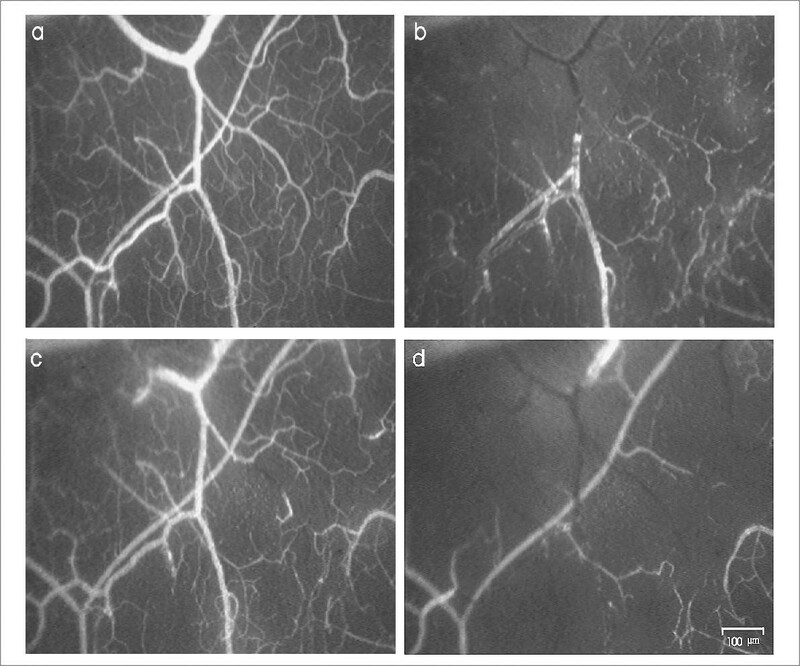 A sequence of photographs documenting I/R-induced injury in the microcirculation of a hamster treated with abciximab, in the baseline conditions (a), within 30 min of ischemia (b), 10 min (c) and 30 min (d) of reperfusion. Postischemic capillary perfusion increased significantly within 10 or 30 min of reperfusion even if there was not complete recovery. This work was supported by Italfarmaco SpA, Via dei lavoratori, Cinisello Balsamo, Milano, Italy. We thank also Dr. P. Mascagni, Head of the Research Lab. Italfarmaco, for the constructive discussions of this work.